You grew up with games. Now games need to grow up with you. Hey there! Thanks for dropping by Growing Games! Take a look around and grab the RSS feed to stay updated. See you around! When a Problem Comes Along… You Must Fold It? 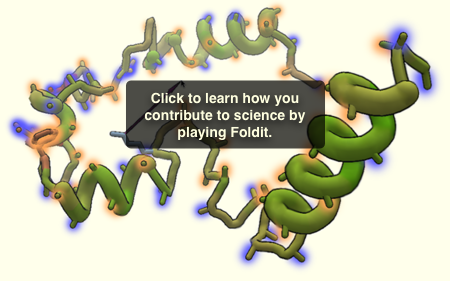 I’ve just posted another contribution on the University of Washington (UW) Critical Gaming Project blog, this time about Foldit, a protein-folding game developed by UW researchers. The convergence of science and gaming is, of course, of particular interest to me, and the game suggests that the term “transmedia” could be usefully extended beyond multimodal storytelling. I encourage you to try the game for yourself!